You are here: Home / Organizational Behavior for School Districts / Change Management in School Districts / How Can Leaders Create School Districts that Embrace Innovation? This was a recent question from a school leader who was trying to implement broad curriculum design changes in their school district. The school leader was simply trying to pivot towards creating units of instruction lesson planning. Many teachers in the building were not embracing the change. Sound familiar? The reasons for change and innovation vary from district to district but the question of how to create school districts that embrace innovation is an essential one that school leaders are tackling head on. Disruption of familiar routines is one of the largest barriers to change. People like routines. Routines are predictable and comfortable. If people are disrupted from their routine and invest their time to create or embrace something new, they want to know that it is worthwhile and will endure for the foreseeable future. Herein lays one of the greatest conflicts between the reality of education in the 21st century and our feelings towards change. New technologies, new curriculum, new models of instruction, and educational platforms are changing so rapidly that from the time a district decides to adopt the change, to the time they actually roll out the change, there is a new and more promising idea that is waiting on the horizon and the cycle of change begins again. When school leaders try to bring about change and staff members are hesitant to jump on board, it may not be that teachers are change resistant, it could be that staff members are change fatigued. (b.) Bring about changes in a way that fosters engagement among staff members. Among all the changes that are occurring or that will occur over the next few years, how can we identify, test, and implement changes that lead us towards our mission and allow staff members to feel engaged through job control, autonomy, self-efficacy and relevancy? When trying to answer the question “How to create school districts that embrace innovation?” school districts aren’t alone. It turns out businesses are struggling with these realities as well. Rita McGrath is a professor at Columbia University Business School. A few years ago she wrote a book titled The End of Competitive Advantage: How to Keep your Strategy Moving as Fast as Your Business. In an interview about the premise of her book McGrath said, “One of the core business ideas for many years has been this notion that firms should be seeking a sustainable competitive advantage. You create a product or service that has a lot of entry barriers and that you can protect and enjoy that advantage for a long, long time.” McGrath went on to say that more and more, due to the speed of change and disruption, this strategy does not reflect the reality of business today. In an attempt to further illustrate her point McGrath spoke about BlackBerry. You remember BlackBerry, right? They were one of the first companies to integrate communications technologies that allowed you to talk, email, and search from the same device. They worked for years to bring their product to market and enjoyed their competitive advantage for about two years. Enter the iPhone, Samsung, Windows phones, Android, etc. Schools are not private corporations and they are not in the business of protecting trade secrets or creating market entry barriers. However, it is possible for organizations to create their own barriers to innovation when they fail to create the framework and culture that embraces innovation. 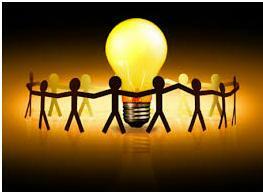 McGrath provided four suggestions to help organizations become more effective innovators. As you read through these suggestions consider the areas your district is already doing well and which areas could use some improvement. When schools don’t communicate their culture to adapt and change teachers are more likely to relentlessly defend old and comfortable ways of doing things at the risk of not implementing changes. A culture that promotes changes begins by embracing and learning from failures and missteps. 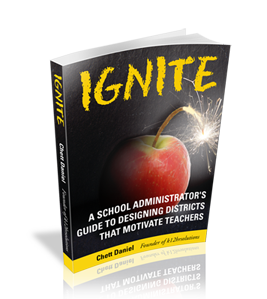 Establish clear guidelines for bottom up change efforts and establish focus and direction that is aligned to your overall district mission. Sometimes organizations fail to develop a culture of change because of their leaders’ fear of losing control and oversight. Creating a culture of change requires trust, vision, and humility to learn from mistakes. School leaders, through a clear vision towards innovation, can help staff members begin to move away from mindsets that defend ineffective past methods and implement healthy and valid methods of testing new methods and materials for instruction. (Warning: As many of you know from being former educators, this can be liberating and terrifying at the same time). Change should take place when change is needed. This sounds too simplistic and obvious but in business and in education change is often implemented due to new trends or fads. Districts are beginning to get much better at collecting and interpreting data. Data exists in many formats. Your data could obviously be assessment results. Data could also be results from climate surveys conducted among staff, students, and parents. It is critical to understand data does not provide all the answers. Data can be used to provide clues and make inferences, but research and leg work must be conducted to reach valid conclusions. Data can also be misleading when viewed in isolation or over a short period of time. With that being said, school leaders should be open to the messages the data is giving them and use that as a starting point to question avenues for innovation. It is important at this stage that school leaders are not simply using data that confirms preexisting beliefs. Too often, untested assumptions are taken as facts. In her article McGrath tells a story about how the make up company Revlon spent one hundred million dollars developing cosmetics targeted to help women of a certain age look younger, only to find out later that women don’t like to be reminded of their age when shopping for cosmetics. This may sound like a ridiculous misstep that could only occur in the business world, but how many times do districts invest in technology, curriculum, or other materials, only to find out later those resources were never used or wanted by staff members? Courageous leaders seek to get unfiltered information by seeking direct feedback from stakeholders through personal conversations. McGrath suggests doing your own version of “Undercover Boss.” While it may not be possible to hide your identity, it is possible to have personal conversations and look for common threads where innovation needs to be addressed. Setting aside the time to have personal conversations can be a large commitment, which is a great segue to the next step. Steven Covey, educator, author, businessman, and time management guru once wrote “Most of us spend too much time on what is urgent and not enough time on what is important.” If innovation is an important part of a district’s future time must be allocated to research areas of need, initiatives worth pursuing, planning, development, and delivery of lessons, and reflective feedback from stakeholders. Providing designated time ensures urgent matters don’t get in the way of truly important matters. Additionally, time set aside for innovation isn’t only for educators. School leadership must also designate time to explore innovations in their daily practices as well as collaborate with subordinates to see what efforts are working and what can be learned from those that failed. What does designated time for innovation look like? That will likely vary from district to district. It could be a block of time one day a week or even an entire day. Some school districts may choose to carve a week out of each quarter to explore ways to implement innovative practices and lessons. One thing is clear, if districts make innovation a part of their vision, but provide little time and guidance for how innovation will occur, it will likely fail. What does disengagement have to do with innovation in school districts? Aren’t these two concepts at odds with each other? Disengagement is the process of moving away from established methods, technologies, ideas, etc, while innovation is the movement towards new tools and ways of doing things. As districts explore innovation it is important to evaluate areas and effective strategies of disengagement for one very obvious reason. There is only so much school leaders and staff members can put on their plates. Going back to research on employee engagement, the data is clear. Job demands have a tremendous impact on employee engagement and employee burnout. When school leaders discuss their vision for innovation, staff members often translate that as a pile of new initiatives that will be put on their plate. When districts have a clear strategy to disengage from previous practices and communicate that process as a piece of their innovation strategy, staff members realize the district is concerned about their overall workload and have developed a pathway to take things off their plate. Disengagement strategies not only address concerns of staff members, they can also be proactive in dealing with concerns from other stakeholders. McGrath suggests organizations ask four questions as a part of their overall disengagement strategy. 1. Are we open to the idea that we may not need to disengage? What metrics do we study? Do you have effective methods to communicate change? Do you have buy in from key staff members? Spell out the guardrails. Where are the places you want to explore and are there any areas that are off the table? 3. Do we have a way to recoup value from materials, technology, etc. that we are disengaging from? 4. Are we prepared to manage the howls of outrage from stakeholders who are not on board? Some areas of disengagement may hold sentimental value to stakeholders. How will the district communicate the value of new directions? What supporting evidence exists to demonstrate that disengagement is necessary? Change is often a major source of employee disengagement. Developing a strategic plan that encourages a bottom-up approach to innovation within school districts disallows staff members from accepting practices because they are comfortable. Teacher and principal driven innovation in school districts provides a path and opportunity for professional educators to create changes they know are best for students. If change is inevitable why not develop a culture that allows educators to become perpetual partners for change.